She takes care of her friends. The Princess of Swords is the Protector. A fierce nurturer, she is the mother who will kill to keep her children safe. Although she just loves a good fight, Xena would prefer not to kill, because as a nurturer she cherishes life. But if anyone messes with those under her protection--watch out! 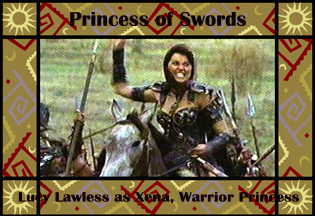 You'll find plenty of Xena swordfights at Michelle's Xena Picture Library.